We’d love your help. Let us know what’s wrong with this preview of Silently, the Cat, and Miss Theodosia by Felice Holman. If you have heard an odd whizzing in the night, you may have just missed Miss Theodosia, who with the advice of her cat, Silently, helps the people she meets after dark. 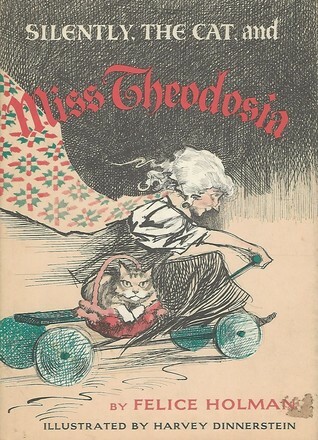 To ask other readers questions about Silently, the Cat, and Miss Theodosia, please sign up. This reminded me in some ways of Mr. Widdle and the Sea Breeze - older person, stuck in their ways, learning to live a little. Of course there are differences, in that Miss Theodosia does live, albeit at night. These vignettes (it's not quite a story) are charming and if you're lucky enough to find a copy - grab it. Felice Holman was born October 24, 1919, in New York City. She graduated from Syracuse University in 1941 and later worked as an advertising copywriter. She married Herbert Valen in 1941 and some of the experiences of their daughter, Nanine Elisabeth Valen, would serve as the model for her first book, Elisabeth, The Bird Watcher, which was published in 1963. During the 1960s, she published two more Felice Holman was born October 24, 1919, in New York City. She graduated from Syracuse University in 1941 and later worked as an advertising copywriter. She married Herbert Valen in 1941 and some of the experiences of their daughter, Nanine Elisabeth Valen, would serve as the model for her first book, Elisabeth, The Bird Watcher, which was published in 1963. During the 1960s, she published two more "Elisabeth" stories and wrote some humorous books for children. In 1970, she published her first book of poetry for children: At the Top of My Voice. Critics praised the poems for their "originality, humor, and point." She continued to write humorous stories for young readers, including The Escape of the Giant Hogstalk (1974) that critics called filled "with giggles interspersed with horse laughs all the way." In the 1970s, she also began writing realistic fiction for young adults. Her book Slake's Limbo (1974), the story of a boy who lives in a cave below Grand Central Station, was lauded for its "authenticity of detail" and as "remarkably taut" and "convincing." In 1975, she co-wrote The Drac: French Tales of Dragons and Demons, a collection of French legends with her daughter, Nanine Valen.